› Author AffiliationsWe acknowledge the financial support from the National Science Centre Poland (grant no. 2016/22/E/ST5/00566). In recent years, a plethora of synthetic methods that employ hypervalent iodine compounds donating an atom or a group of atoms to an acceptor molecule have been developed. Several of these transformations utilize organocatalysis, which complements well the economic and environmental advantages offered by iodine reagents. This short review provides a systematic survey of the organocatalytic approaches that have been used to promote group transfer from hypervalent iodine species. 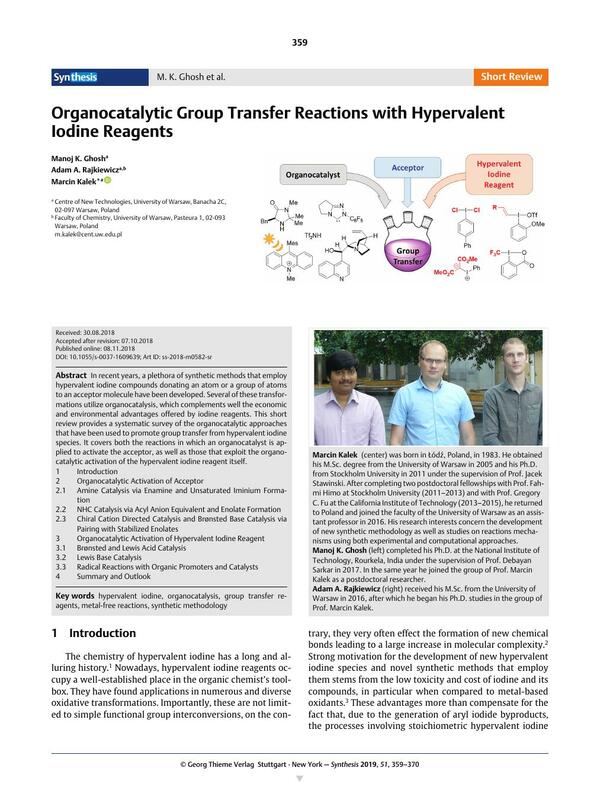 It covers both the reactions in which an organocatalyst is applied to activate the acceptor, as well as those that exploit the organocatalytic activation of the hypervalent iodine reagent itself.